The term “3D” gets spoken of a lot lately, especially “3D printing.” Though the term seems commonplace, sometimes we forget why 3D things are so cool and interesting. By turning something from flat 2D (two-dimensions) into a fully functioning 3D experience, we are not only engaging more senses (tactile touch) we are creating objects that have presence from 360 degrees of viewing. In order to expand this conceptual understanding of 3D printing, we challenge you to flip the term and consider what it truly means to “print in 3D.” Printing in 3D can be done with or without technology, as many mixed media artists will attest to the fact the amplifying their use of tactile textures is a favorite way to add the third dimension to their artworks. To do this, we begin with hot glue…one of our favorite tools! Not only can hot glue be used to attach objects together or fix broken things, it is an amazing starting point for understanding 3D printing. After all a 3D printer is essentially a hot glue gun on wheels that is controlled by a computer. Using a flexible silicone mold (i.e. Small ice cube trays and/or chocolate candy molds bought at grocery store for about $2 each, various shapes: hearts, stars, shells, mustaches, leaves, etc.) you can fill in with hot glue and small craft findings (sequins, glitter, etc.) to create your own 3D objects. Experiment with adding small amounts of paint or food coloring to change the color and texture of the hot glue. These objects can be displayed on shelves or turned into pendants and key chains by attaching yarn or cords. See more details in this tutorial (coming soon). Using parchment paper (baking paper bought for a couple of dollars at grocery store) you can create 3D doodles and unique 3D objects. Experiment with drawing directly onto the parchment paper and see what happens when hot glue is added. Does the drawing transfer? Experiment with adding craft findings to the hot glue as you draw. Does the hot glue drawing have the strength to stand up on its own as a sculptural object? What can you do with these 3D hot glue creations? Use the dried creation as a printmaking stamp (cover with paint and press down on thick paper to make a print) or embossing tool (place paper over the creation and rub with crayon to create colorful textures). Attach yarn or string and turn it into a sun catcher for your window or wear it as a necklace, ring, or bracelet. See more details in this tutorial (coming soon). Using Autodesk 123D Design (free download for Mac, iPad, and Windows) or TinkerCAD (free web-based app used directly in Internet browser) you can create your own unique 3D models. The completed 3D models can be exported as “.STL” files and sent to a 3D printer and printed into a physical object. Don’t have a 3D printer of your own? Upload your file to www.shapeways.com and have them print it for you (costs vary based on the size of your model, which material you want it printed in, and how soon you want them to mail it to your home). Don’t want to wait for snail mail…search for a 3D printing service near your home on www.3Dhubs.com (enter in your zip code and a list of local 3D printing services are provided, rates vary). View our resources page for more related information. Want more 3D activities? Check out our project page for more ideas. Step 1: Find or create a clean clip art style one color logo. Step 2: Open image in GIMP or Microsoft Paint, which are both free, raster-based image editing software programs. Step 4: Open file in Inkscape, which is a free, open-source vector image software program. Step 9: From there, you can further manipulate your 3D object. Join us at the San Marcos Public Library for “Maker Play” workshops on July 10, 17, and 24 from 2-4 pm. Explore technology including 3D printing and simple robotics to bring your imagination to life with hands-on projects! This workshop is free and geared toward kids ages 7-12. Space is limited so please register through the SMPL website here. 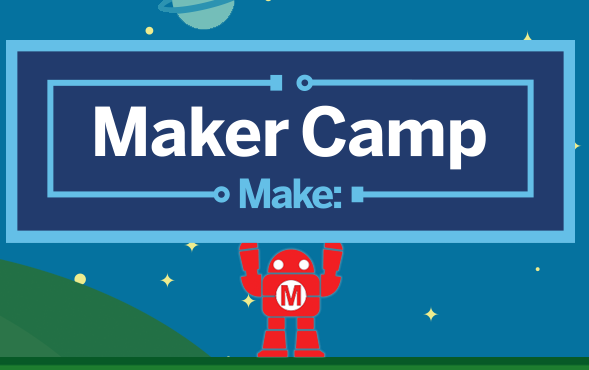 This is a series of annual workshops that are in collaboration with Maker Camp, which supports a unique global summer camp experience for young artists and inventors ages 7-12. This year’s themes include: Far-Out Future, Flight, Fun and Games, Fantasy, Funkytown, and Farmstead, which will challenge every participant to learn new skills across a wide range of interests. Have you ever wished that an awesome DIY project would arrive on your doorstep complete with everything you needed, including instructions and materials? With TinkerCrate that is possible! You can choose from age appropriate DIY projects to spark creativity and awesome learning experiences with one simple monthly subscriptions. Once you subscribe, a box filled with awesomeness will arrive on your doorstep each month!